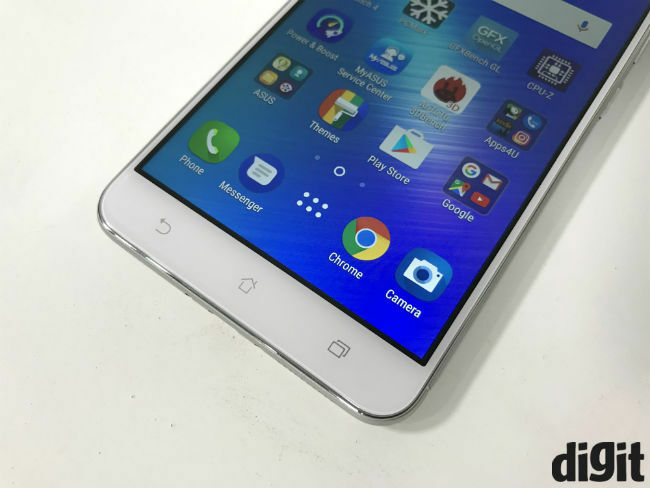 The Asus Zenfone 3 Laser costs Rs. 18,999, and though it has a better camera than most of its competitors, it’s not the performer it needs to be. The Asus Zenfone 3 Laser indeed has a camera that’s ahead of its peers, but that’s not enough to justify the 19k price tag. Snapdraon 430 is just not suited to this price range and the phone feels really slow and stuttery. 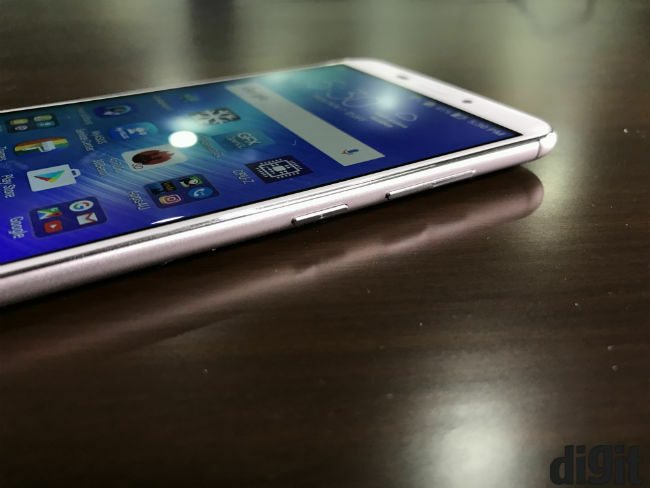 It’s not a good overall smartphone, and the Lenovo Z2 Plus offers much better value for money. Remember the teacher’s pet back in school? The kid who would ruin things for all others? That’s pretty much how the sub-20k market works today. Phones like the Xiaomi Redmi Note 3 and LeEco Le 2 ruin things for most other companies. But, does that mean everyone should, or may, provide the same value? Well, Asus doesn’t think so. The Asus Zenfone 3 Laser is priced at Rs. 18,999, almost double its predecessor, and its specifications do not match its price tag, following current market trends. Why, then, is Asus betting that you’ll buy this phone? Here’s what we found in our review of the Asus Zenfone 3 Laser. Starting with the obvious, the Zenfone 3 Laser looks similar to the Xiaomi Redmi Note 3. However, I prefer this design. The Laser decidedly feels lighter, thinner and more premium as well, giving it ergonomic value over its competitors. The phone nestles in your palm and the curves near the edges make it easier to use with one hand. To be clear, the Zenfone 3 Laser isn’t perfectly suited for single-handed usage, but it’s still a pretty efficient design. The back has a metallic finish, which feels good, especially because of its smudge resistant, and oleophobic properties. It’s smooth and seamless, and feels more “metallic” than similarly designed phones. The body also seems well put-together and sturdy, capable of withstanding usual scratches, like those caused by keys in pocket. It may get scratched if dropped, though. The only real fault in the design is in the cuts for the micro-USB port and screws at the bottom. You probably won’t even feel them, but running your fingers across these holes reveal lack of polish. The corners of these holes are sharp, and can occasionally leave marks on your hands. Also, the capacitive back, home and recents buttons below the display aren’t backlit. Personally, I don’t mind that, but many do. You’ll find the earpiece, front camera and sensor hub above the display, and the soon-to-be obsolete (if Apple has its way) headphone jack is on the top as well. The biggest misstep with the Zenfone 3 Laser’s design is in the fingerprint sensor. Asus decided to go with one on the back, but with a thinner, rectangular design. This reduces the surface area for your finger to interact with the sensor, and makes it tougher to find. While it’s good at recognising your print, the smaller surface area makes it seem slower because you’ll often be shifting your finger to find the right spot. This, combined with the rather slow phone (more on that later), makes the fingerprint sensor quite unsavoury. Interestingly, Asus’ peculiar ‘concentric circles’ design can only be found on the home button, and the volume rocker on the right. This, for me, is a big positive. The concentric circles looked good on the Zenfone 5 (and that family), but I’ve found them disagreeable on all Asus phones since then. 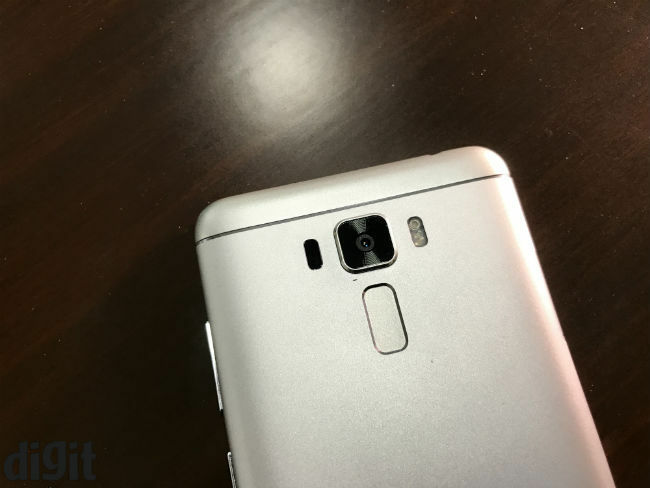 The phone also has a sizeable camera bump at the back, with a shiny metal lining around the camera unit. On either sides of this are the dual-LED flash and the Laser AF system. Overall, I’m quite satisfied with the Zenfone 3 Laser’s design. Yes, Asus can refine it more, but it’s still one of the better-designed smartphones in this price range. It feels premium enough, and is even quite ergonomic, despite the 5.5-inch display. You’re looking at a pretty pixel-dense display, measuring 401ppi and with a 2.5D curved screen on top. It’s reasonably good with colours, although it doesn’t provide the deepest blacks. It’s on the upper end of the IPS LCD family, though, and that should satisfy most. 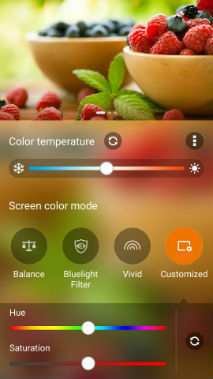 Asus also allows you to tweak the display’s colour temperature, hue etc., using its preinstalled Hue app. There’s a slight shift in colours from some angles, but not enough to complain. The achieves maximum luminance of 598 Lux, which is not the best but works. While colours and sharpness aren’t really an issue, I’m not a big fan of the display’s reflectiveness. The glossy display affects sunlight visibility, which isn’t the best, and LED lights in your home will also be in conflict. You may have to hold the phone in your hand throughout full movies, unless you find a spot away from light sources. Further, Asus uses Corning Gorilla Glass for the screen, which is fine. However, the display is somewhat weak against oily fingers. Moreover, the touch sensitivity doesn’t seem as good as it is on most smartphones today, irrespective of price. Touch latency is good enough, but the display doesn’t feel very premium. Even Asus’ ZenUI does not feel premium. The Zenfone 3 Laser, like all other phones in the Zenfone 3 family, have ZenUI 3.0 layered over Android Marshmallow, v6.0.1 to be precise. Asus’ UI is bloated and lacks polish. There’s just too much happening on the phone. I can’t remember a time when an Asus app didn’t notify me of something I didn’t care about. Even the Splendid app, which tweaks display temperature, could simply have been put into the Settings menu. Instead, Asus created a whole new app for it, adding to clutter and disturbance. 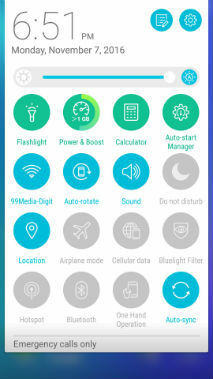 You have apps like Do It Later, Flashlight, Go2Pay, Mobile Manager, MiniMovie, Puffin and so on. All of these can be replaced by better apps from the Play Store, and I had little use for them. There’s even a Game Genie that’ll appear as a floating bubble while you game. It makes no sense, since the Zenfone 3 Laser struggles to render high frame rates on graphically intensive games in the first place. Asus has even provided a Laser Ruler app, which apparently uses the Laser auto-focus to measure the distance to an object. The app, however, can’t measure anything over 50 centimetres, and I didn’t find any practical real-world use case for it. Most of Asus’ apps can’t be uninstalled, either. You can disable them to avoid annoying notifications, but you’d still not get that lost space back, and each megabyte matters today. This is even more of an issue because all of these apps are asking for additional permissions to run, and that can be irksome. 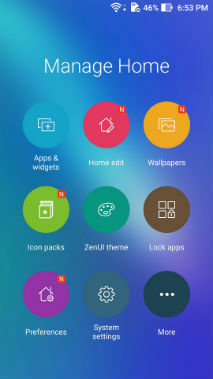 Bloatware aside, ZenUI feels like the early days of Samsung’s Touchwiz. I find it childish, and an UI made simply for the sake of differentiation. If there are background enhancements to the Android software, they’re not discernible on regular usage, and that makes the UI all the more unnecessary. The only aspect of ZenUI 3.0 that’s useful and you’ll really use is Pixelmaster 3.0, which is built into the camera app. We’ll discuss this when we get to the camera. For me, the most disappointing aspect of the Zenfone 3 Laser is its performance. It’s a slow smartphone that doesn’t justify its price tag. Qualcomm’s Snapdragon 430 SoC makes sense on a sub-10k smartphone, but not here, and especially not with a Snapdragon 820-powered device available at a lower price point (the Lenovo Z2 Plus). In practice, you’ll easily find lags and stutters on the Zenfone 3 Laser. It lags heavily on games like Injustice: Gods Among Us and Asphalt 8, and takes considerable durations to load. The phone’s slow single-core performance speeds increase app load times – for anything from Facebook to Subway Surfer, and calling one app from another results in noticeable lags. As mentioned before, the fingerprint sensor is slow as well. The upside with all this is that the Zenfone 3 Laser doesn’t heat up. Under a temperature of 24 degree Celsius outside, the Laser doesn’t rise beyond 38 degrees after over 15 minutes of gaming, and recording video for 10 minutes takes the temperature to about 39.5 degrees. This, though, is warranted, given the weak performance. The Snapdragon 430 doesn’t support 4K video, which is disappointing for a camera-centric smartphone, and I’m willing to trade a few degrees for better performance. The Zenfone 3 Laser is slower than a last-gen smartphone like the Moto X Play. The Power Management settings offer slight customisation to the performance. You can choose between Super Saving, Power Saving, Normal and Performance modes. The temperatures above are on the Normal mode, and turning on Performance Mode doesn’t bring much of a difference, either. Our Asus Zenfone 3 Laser stress test has more on this. The absence of snappy, fluid performance also means that the camera app takes a second to load. This means that you’ll often miss a moment, because the camera was loading. However, when it does load, the Zenfone 3 Laser does a reasonably good job. It has a 13MP f/2.0 camera with the Sony IMX214 sensor and 1.127mi pixel size. It’s quite good under well-lit conditions and sunlight outdoors. Under white LED lights, the phone loses some details to noise, and images aren’t very sharp. However, colours are retained quite well across various lighting conditions. Essentially, you’ll be fine unless you’re zooming into photos. Asus says, the Laser AF system focuses in 0.03 seconds, which may even be true under ideal conditions. In practice, though, your hand shakes and the phone will keep changing focus points the longer you point the camera at a subject. Moreover, Laser AF is best suited for close-up photography, and during low light shots. And that is where the Zenfone 3 Laser excels. Under low light, close-ups are decent, but the phone creates considerable noise and loses a lot of details when shooting scenes. Low light shots are considerably enhanced by the low light mode, though, and it is well ahead of most of its competitors. Here again, speed matters. Asus’ slow camera makes it difficult to just point and shoot. You’ll get good photos if you have the time to fix focus manually, or by tapping the screen, but the auto mode isn’t very dependable. On auto, the camera sometimes messes up the white balance and subdues colours. This is where Pixelmaster 3.0 comes in. Asus’ camera app gives you a Manual mode with control over ISO, White Balance, Exposure Value, Focus and Shutter Speed. 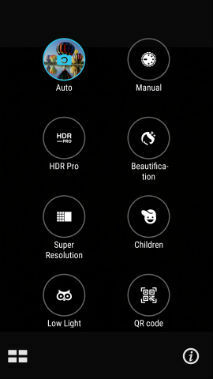 There are also Super Resolution, Low Light, Manual, HDR Pro, Beautification and Children modes. Of these, the low light mode is the really useful one, but it also adds a few button taps, thereby increasing the time taken to shoot a photo. This mode basically increases image brightness, while softening the details. It’s useful, but would have been better had Asus made it a part of the regular Pixelmaster algorithm than instead of adding a separate button for it. The Super Resolution mode allows you to take 52MP photos, by taking multiple images using the 13MP camera and then combining them together. You can have some fun with it, but it remains more of a gimmick, as it has been before. In general, you’ll be using the auto-mode most often, which can shoot in HDR, HDR Auto and simple auto modes. A 3000mAh battery drives the Zenfone 3 Laser, and as in the Zenfone 3, it lasts quite long. On heavy usage, with lots of browsing, calling, texts, IMs, social networking, and some video, the phone dropped from 80% to 20% battery in about 8-9 hours. That’s quite good, considering the usage. A full workday’s battery life is easily obtainable, and for many others, it’ll run for over a day and a half. In practice, charging it every night should be enough, which is pretty much the industry standard. The Performance Mode doesn’t seem to affect battery life much either, which is warranted given that the performance doesn’t increase much, either. You can use Asus’ power manager when needed, but it’s pretty standard. The more intense power saving modes turn off the mobile data and limit both the processor, and screen brightness. I wonder how difficult it would be to drop the screen resolution as well, though. That’s a feature I quite liked on Huawei’s EMUI. The Asus Zenfone 3 Laser has a better camera than the Xiaomi Redmi Note 3, LeEco Le 2, Lenovo Z2 Plus and Xiaomi Mi Max. However, these phones are also miles ahead in performance. In my opinion, what those phones lack in the camera department, they more than make up for in others, and that’s why I wouldn’t recommend the Zenfone 3 Laser over them. Asus has done a good job designing this phone, and it has a decent display as well, but there are ifs and buts all over, and the phone is not very good in overall terms. If you want a camera-centric smartphone, the Nubia Z11 Mini (which we’ll be reviewing soon) is a better buy. It’s cheaper and faster than the Zenfone 3 Laser, with a very good camera. 2. Display type and size? 4. Preferred choice of brand? LG, Sony, Moto. No Samshit(surprise?). 5. What camera option you want (flash, front facing camera)? Front facing camera has to be good. Battery life and camera quality would be same too, I assume? Would a lesser RAM in G2 be a problem? Please suggest between Yu Yureka or Asus Zenfone 5. Or may be any other device under 10k. +1 to Zenphone 5. But if you can get Yureka, then get it but not for even a penny more than 9k. 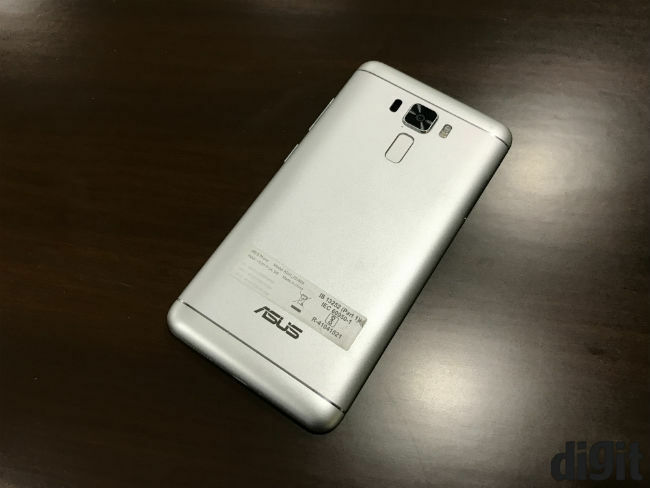 BTW – Asus Zenfone 5 upgraded version is coming too or it has already arrived; not to sure! Please guys, throw some light on the upgraded version. You can expect the updated version soon. the GPU is the same one present in ipad air, at 199 $ this sounds too good to be true, a 12k phone with good warranty that delivers this much performance, much wow..
there’s a version with 4 GB RAM, personally I think its a bad move, fragmenting owners of the same phone into two categories..
PS: f2.0 is wrong, its actually f2.7..
[QUOTE=Nerevarine;2192221]the GPU is the same one present in ipad air, at 199 $ this sounds too good to be true, a 12k phone with good warranty that delivers this much performance, much wow.. Need help choosing between Asus Zenfone 5 and Moto G 2nd gen.
A price difference of 4k … what advantages does moto g have? Please suggest me a good back cover (Black) for my asus zenfone 5, I found some cover in flipkart but reviews are average.